Hello, once again! Antoni, here, with another piece of fan art. As you can see in my picture, it’s Basuli from The Legend of Tarzan, Simba from The Lion King and, of course, Tarzan himself or as I would like to call them, The Wild Jungle Brothers. Their commanding presence, strong bond as brothers, well-built muscles, extraordinary combat prowess, and superhuman athletic abilities are enough to leave any poacher, marauder, destroyer, and/or traitor quaking at the sight! So, don’t mess with these badass, muscular warrior bros. There is no doubt that I love both Disney’s The Lion King, plus its sequel, bits and pieces of The Lion Guard, and a bit of Lion King 1 1/2, and Tarzan, as well as the television show following the movie, The Legend of Tarzan. When it comes to jungle-themed animated installments, a crossover between these two actually seems wonderfully plausible. They are both set in Africa, albeit in different countries, and they balance action with a bit of romance, friendship, and humor. Plus, having a crossover between Basuli, Tarzan, and Simba seems like the stuff of legends because of their overall heroism and the fact that they are super strong Alpha males in their own special ways. 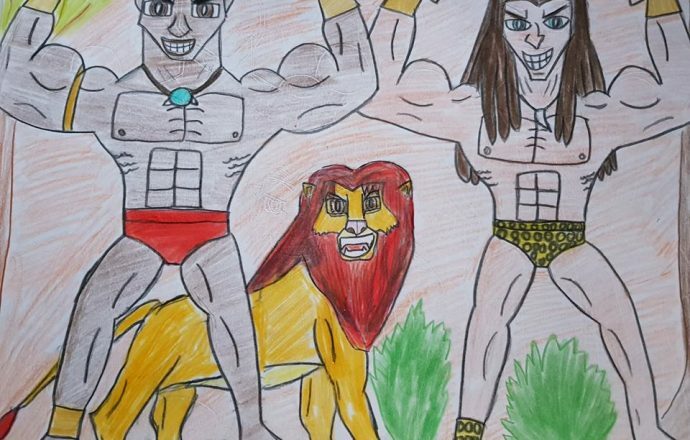 To make this fun, for those of you reading and taking a gander at my piece of fan art, I would like to invite you to comment some captions for Basuli, Simba, and Tarzan respectively. The floor is yours and I hope you have fun with commenting your captions. Ever since I was a nine-year-old boy, I was really psyched to see that there was a television continuation of Disney’s Tarzan in the form of The Legend of Tarzan. Even when I was in Hong Kong in a bookstore, I read the original tale by Edgar Rice Burroughs and was actually fascinated that there were actually humans that came to Tarzan’s side of the jungle headed by Chief Mbonga and his son, Kulonga, who ended up killing Kala with his poisoned bow and arrow. This action then leads Tarzan to avenge his foster mother’s death by hanging Kulonga in a tree and stabbing him in the heart with his hunting knife. Eventually, my curiosity was further aroused when I saw a teaser containing an actual African native in the show, something that the 1999 film did not really show. As I watched the show itself, I found out that the African native’s name was Basuli, who is a member of the Waziri tribe. It was from Basuli’s debut episodes, “Tarzan and the Poisoned River Parts 1 and 2”, did I start developing a secret crush on not only him but Tarzan too. If you were in my place and a nine-year-old boy, I am sure you would’ve been ashamed at telling your parents that, but for a girl, it would be no problem. Anyways, as he made further appearances in “Tarzan and the Fountain” and “Tarzan and the Eagle’s Feather”, I grew to love the brotherly relationship these two have. So much so, that I am convinced that Tarzan’s biological parents should have gone to the Waziri tribe’s area, though they would have ended up being brutally murdered by Sabor the leopardess, and it would be up to Chief Keewazi to raise the orphan boy as his own alongside his biological son, Basuli, thus having both boys be brothers. There are definitely highlights from Basuli and Tarzan in the TV show, and those were: the pair of them wrestling each other before Chief Keewazi stops the commotion and introduces Tarzan to the Waziri village, the double roar Basuli and Tarzan gave to the greedy mine owner Ian McTeague, which was their shining moment of all time, and the whole race for the eagle’s feather for Basuli to marry the lovely Naoh. It was a major shame that Basuli was only featured in a total of four episodes because I truly love him as a character and I wish more of him would have been fleshed out. Sure, Tarzan’s, Terk’s, and Tantor’s relationship is basically on the best friends level, but with Tarzan and Basuli there is truly something deeper akin to brotherhood because of how they compete with each other, have certain fights, and, of course, their superhuman physical capabilities, which made that one scene in “Tarzan and the Eagle’s Feather” where Basuli and Tarzan were running, gliding, vine-swinging, and tree-surfing before they find themselves in a strong river stand out to me so much. Special acknowledgment also has to go to Phil LaMarr, who did an amazing job at capturing Basuli’s proud and mighty nature, as well as having an irresistible vocal presence, which, in turn, was applicable in giving Basuli his signature swagger. Even though Tarzan and Simba are from completely different installments, fanfic authors and fan artists find it great to have these two characters interacting with each other. Whether it’s them being good friends or almost akin to brothers or even having Tarzan live in Simba’s area, there are a lot of possibilities of how their relationship can be handled. There was a really good piece of fanfiction called Tarzan of the Lions that I really enjoyed reading during my time as a nineteen-year-old in film school. Unfortunately, the fanfic got deleted by the author himself, as he wanted to focus on writing more original stories or fanfics that are not totally beat per beat with original movies. I forgot who wrote it but it’s safe to say that it’s Tarzan meets The Lion King with the first half having The Lion King’s musical number and the second half being more Tarzan-focused. In that story, Mufasa served as Kerchak, an OC by the name of Uzuri served as Kala, although I would’ve wanted Sarabi to take on the Kala part and have Simba and Tarzan be brothers, Scar is an amalgamation of Tublat and Sabor, and Timon and Pumbaa are still themselves but with hints of Terk and Tantor. As for fanfics between Simba and Tarzan that still exist, I found myself fancying TightlyWrappedCoils’s Two Worlds, One Family and etaris333’s Tarzan and Simba, Brothers, which I have yet to make a recommendation on them, but I want to leave this post, especially for Tarzan, Basuli, and Simba. Before I get on to the actual drawing that I made, I want to describe my idea for an AU for these three amazing jungle warriors. Lord John Greystoke and Lady Alice Greystoke are on an expedition with their infant son to study African tribes, their culture, their livelihood, and their overall society. Their raft lands on the Waziri territory, where Chief Keewazi is initially skeptical of their arrival, but nonetheless welcome the Greystokes with a place to stay in the form of a hut slightly distant from the village. Little do they know, Sabor the leopard is on the prowl and spots the couple with their newborn sleeping baby. Sabor takes out John first and he tells Alice to run for her life with her baby boy in her arms. Sabor is still hot on the prowl, as Alice frantically knocks on Chief Keewazi’s hut. Keewazi wakes up and Alice entrusts her baby to be safe under his wing. Alice exhausted from the commotion tries to get back home to rest, but it’s too late. She succumbs to her fatigue, lays motionless in the middle of the jungle, and Sabor does away with her. Back with Chief Keewazi, he too has an infant son of his own, Basuli. Since Chief Keewazi is very much familiar with the jungle and can understand the animals’ language, he decides to name the orphaned infant boy, Tarzan, as his skin is white unlike the rest of the villagers. This is a moment of pride for Keewazi, as he has two sons to call his own and they will rule side-by-side as future chiefs of the Waziri. Time passes on and Basuli and Tarzan are headstrong, young lads, being respectively ten and nine years old, basking in each others’ company as brothers. They do a lot of activities from wrestling to racing each other to swimming to venturing into the jungle accompanied by Chief Keewazi. Tarzan starts to have a knack for imitating animal sounds and understanding their languages, something that both Keewazi and Basuli find incredible. Basuli gives it a go with the gorillas too, and though he is good, he is nowhere near proficient as Tarzan. They even find Simba, who has been lost in the jungle after what happened in terms of Mufasa’s death. Tarzan convinces Simba to come live him, Basuli, and Keewazi, and all three approve, thus welcoming the lion cub with open arms to the point where Simba is the third brother. The three brothers would even swear an oath to stay together forever, which goes along like this. be it friend or foe. in times of joy and strife. for we are strong warriors. 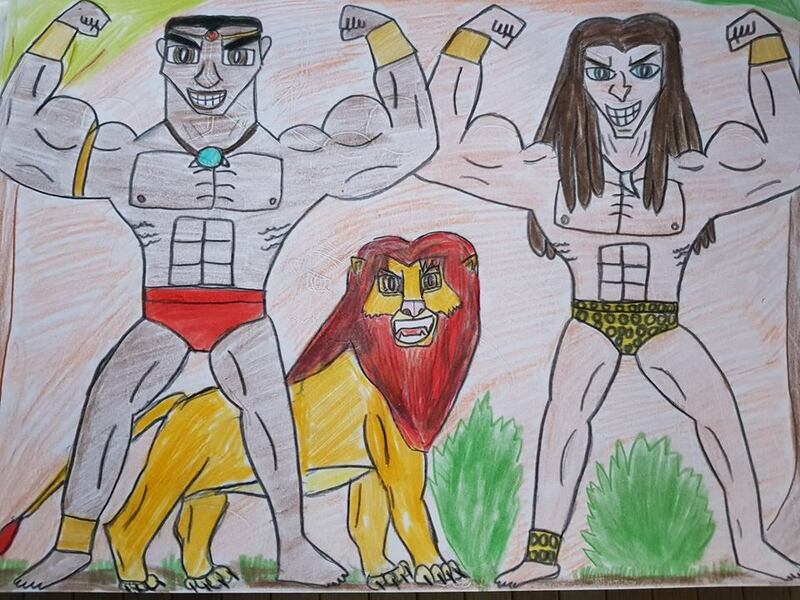 Simba, Basuli, and Tarzan swear to their father that they will become the best warriors the Waziris have ever seen. Even more so, Keewazi will teach his two human sons how to properly grapple, wrestle, and do general hand-to-hand combat, how to shoot with a bow and arrow, how to handle a spear, and how to defend their home from invaders. In Simba’s case, he will learn how to hunt, how to wrestle with humans like Basuli and Tarzan, and even self-defense. As time passes on, Simba, Basuli, and Tarzan grow up to be strong, proud, and fierce, thus proving their worth as warriors. So, there you have it. That’s my idea of how an AU of Tarzan and Simba in the Waziri village would look and sound like. Mind you, I have not really thought about what’s gonna happen to Muviro or Sabor. Regardless, it was still enjoyable to describe how different Simba’s and Tarzan’s tale would be if they were to have encountered the Waziris. Plus, I am darn sure Simba, Basuli, and Tarzan will have the strongest bond no one can ever break. Even more so, I am sure that those of you who love writing fanfics will end up being inspired by this idea in particular. So, I hope that this has sparked something and maybe you can write something better than I ever hope to accomplish with a more fleshed-out storyline. With that said, let’s get on to the drawing I made. Basuli has been such a joy to draw, as I am fully aware that his musculature is slightly bulkier than Tarzan’s. In terms of his attire, I kept his head ring, his necklace, his gauntlets, and his ankle band. However, I did away with his cape since I fancy seeing Basuli bare-chested and in a red speedo, at least I kept his signature color. May I even remind you again that I had a crush on him when I was nine and I still do to this very day? So, yes, Basuli being the heartthrob he is was rather addicting to illustrate. Simba was a tough one for me to draw, as I am not an expert in drawing wild cats. I had to get the right color scheme, the right stance, the right features, and even add in a bit of musculature to Simba, as he is essentially this universe’s Battle Cat from He-Man, thus making him a bit more imposing. I also don’t see him as a mascot, as both Basuli and Tarzan are with one with nature thus making Simba their brother, well more chronologically their older brother seeing as The Lion King was released five years before Tarzan. In spite of this challenge, I am happy I got through this alive. Tarzan was also a joy to draw, even though his illustrating his dreadlocks were a bit of a pain. I also had to remind myself that Tarzan is a bit lighter than Basuli not only in skin tone but physique, though with the latter case I did make him buffer than usual. In terms of his attire, I actually like Tarzan in a leopard-skin loincloth and ankle band than his brown loincloth. Let’s just say that the garments were in courtesy of Sabor’s hide, polished to perfection by the Waziri seamstresses, and given by dear old daddy Keewazi as a rite of passage present to Tarzan. Moreover, I gave Tarzan golden gauntlets like Basuli, thus showing that they are brothers forever. I cannot begin to tell you how much sentimental value both The Lion King and Tarzan have in terms of their nostalgia and how well they hold up in their own ways. Aside from having such dashing heroes, the potential for a crossover seems exciting. If ever Disney’s The Legend of Tarzan gets remade, I would love to see Tarzan having more adventures with Basuli and have Simba from The Lion King joining their exploits. That would be freaking awesome! Thank you for not only reading this post but also having a gander at my piece of fan art. Basuli and Tarzan certainly captured my heart, even when I was young. In fact, I sort of have more ideas for these guys. Maybe have them be with Hercules in Ancient Greece or have Herc visit Tarzan and Basuli in Africa, which by the way I ship Hercules, Basuli, and Tarzan as my BRoT3 nearly approaching OT3 especially the latter. Or maybe have Basuli and Tarzan be mentors to a teenage Mowgli. Those would sound like excellent fan art ideas, as well as AU ideas. The possibilities are phenomenally endless in my creative mind. Until then, this has been Antoni wishing you all a good night. Tarzan belongs to Edgar Rice Burroughs and the 1999 animated film belongs to Disney. The Lion King also belongs to Disney.